#Kingstown200 - In this bicentenary year of the founding of Kingstown Harbour, a lecture “The History of Dun Laoghaire Harbour” is to take place this Wednesday, 22 March in the south Dublin Bay town. In what is expected to be a fascinating talk organised by the Dun Laoghaire Borough Historical Society is to commemorate the harbour over the past two hundred years 1817- 2017. The foundation stone having been laid by King George IV in what was then to become the world’s largest artificial built harbour hewn out of Dalkey granite. The talk to be presented by maritime expert Cormac Lowth, is to be held in the appropriate venue of the Royal Marine Hotel. The venue dating to the later Victorian period is located off Marine Road is where the talk will take place beginning at 8pm. Admission to non-members is €3. To mark the occasion of the commemorative lecture, a special journal has been published by the Society to celebrate the harbour’s 200th. The journal booklet titled “A Safe Anchorage Dun Laoghaire/Kingstown Harbour 1817-2017” will be launched at the lecture and available at a price of €8.00. In addition copies of the booklet that has a front cover depicting the iconic ‘Mail-Boats’ alongside Carlisle Pier, will be stocked in the nearby Eason's bookstore on Marine Road. #Exhibition – On this first day of Spring marks the launch of The Dublin Dock Workers Preservation Society's free exhibition hosted at EPIC, The Irish Emigration Museum located in the chq, Custom House Quay. The society is dedicated to preserving the rich history and heritage of Dublin Docklands, to honour those who worked in capital's docks and of the surrounding dockland industries. The exhibition (which runs to Monday 27 March) is a journey through the Docklands. So explore the original port of Dublin and learn about this fascinating part of the city, its people, history and industry with EPIC. As part of St. Patrick's weekend (on Saturday 18 March), the Dublin Dock Workers Preservation Society will also host a special series of free talks at EPIC in The chq building’s Galleria. The lectures take place between 3.00pm-5.00pm where guest speakers are Joe Mooney and Ann Matthews. Both lectures should provide an eye-opening and insightful account of the rich social history of Dublin’s docklands that has been slowly disappearing in recent years. Tickets are free but limited to 100 guests. Click here to book via Eventbrite. #Lecture - "A Voyage For Madmen"- The Golden Globe Race 1968-2018 is an illustrated lecture by Gregor McGuckin which is to take place early next month on Thursday 2 February. The talk as part of Glenua & Friends lecture programme begins at 20:00hrs in the Poolbeg Yacht & Boat Club, Ringsend, Dublin 4. There will be an entry fee of €5 in aid of the RNLI. In 1968, nine men set out from the UK in an attempt to be the first person to sail completely alone, non-stop and without any assistance around the world. Of the nine men that left only one, Sir Robin Knox Johnston, would make it back and into the history books. In June 2018, 50 years on from this infamous race, 30 competitors will be setting out again from the UK in an attempt to replicate this great race by sailing alone, non-stop around the world using only technology from the 1960's. This means no GPS, satellite communications, water-makers and modern light-weight materials. Dubliner, Gregor McGuckin, will be one of those on the start line in 2018, aiming to be the first Irishman to sail solo, completely non-stop around the world. In his illustrated presentation, Gregor will tell the story of the original race and what inspired him to compete in the "retro" 2018 edition of the Golden Globe Race. 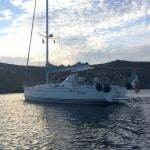 Gregor is a professional sailor who started out in the West of Ireland instructing Windsurfing and Sailing with Glenans amongst others. Since then he has become a professional delivery skipper with over 50,000 miles including several Atlantic and an Indian Ocean crossing. #DoubleLecture - The Winter lecture 2015/16 season of the Glenua Sailing Centre continues with a double lecture programme at the March meeting entitled: ‘The Sea From Two Perspectives’. The first lecture, “Art and The Sea-An Enduring Fascination” will be given by Jessica O’Donnell who is Collections Curator at Dublin City Gallery The Hugh Lane. She is a graduate of Trinity College, Dublin and the University of St Andrews. Her publications include Discover Art (shortlisted for CBI Children’s Book of the Year in 2008) and Harry Clarke The Eve of St Agnes (2012). She also enjoys sailing and is a member of Sailing in Dublin (SID) Club. The talk will explore how artists have been captivated by the sea from many perspectives including how the Impressionists loved portraying people at leisure by the sea; how safeguarding the freedom of the seas was represented in artworks commissioned as war time propaganda; to contemporary artists whose fascination with the sea and marine life continues to inspire. The second lecture is entitled, “Putting Eyes In The Deep Ocean” by Dr Fiona Grant, Ocean Science & Information Services (OSIS), Marine Institute, Ireland. Fiona began her studies in geology before going on to specialise in marine geophysics and earth system dynamics. Her first job was as conservation coordinator for wild salmon and sea trout before taking responsibility for research infrastructures in the Marine Institute. #[email protected] – In celebration of the 50th Anniversary of the Kish Lighthouse off Dublin Bay, the National Maritime Museum of Ireland in Dun Laoghaire is host to a lecture about what is one of Ireland’s most famous and unique lighthouses. The impressive 12-storey structure of the lighthouse (towering 31 metres high when in situ) was constructed five decades ago in Dun Laoghaire Harbour. Tugs brought out the 'floating' 7,000 tonnes lighthouse in the summer of 1965 to the the Kish Bank from where it was sunk into position on the sandbank. It was not until November 9th that year that the light was first exhibited having replaced a lightship. To hear more on the details of how the lighthouse was built, a two-hour lecture takes place in the NMMI this Thursday, 12 November. The lecture “Kish Lighthouse –Before the Build” begins at 8pm and will be co-presented by Brian Kelly and Eoghan Lehane. Tickets cost €10.00 and for more details including an exhibition held in the NMMI click here. In addition the RTE Archives has a link, click here for the ‘Newsbeat’ programme from 1965 on the construction of the lighthouse. #LectureNWpassage - The Winter lecture 2015/16 season of the Glenua Sailing Centre continues with this month’s lecture, ‘Sailing the Northwest Passage’ next Thursday, 12 November. Sibéal Turraoin will present an illustrated lecture at 20.00 held at the Poolbeg Yacht & Boat Club, Ringsend, Dublin. There will be an entry fee of €5 in aid of the R.N.L.I. In the early summer of 2010 Young Larry, a 44ft steel gaff-rigged yawl, left Lymington on the south coast of England bound for the Northwest Passage. Skippered by Andrew Wilkes and Máire Breathnach, she stopped at Dungarvan, Co Waterford to pick up her third crew-member, Sibéal Turraoin, a fourth would join them in Canada for six weeks. 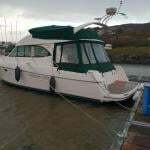 This was their second trip to the Arctic having sailed two years previously in Arctic Tern, a 68ft steel hulled yacht. Leaving Dingle in mid-June, Young Larry sailed 1,700 miles through the North Atlantic to Nuuk, capital of Greenland. The next six weeks were spent cruising up the western coast to Upernavik, waiting for the ice in Baffin Bay to melt. Sights such as whale hunts, giant glaciers, icebergs, sledges and dogs all became common along the way. After a foggy and icy crossing the Davis Strait Young Larry landed in Pond Inlet and collected their final crewmember Dermot O’Riordan for the six week leg through the Northwest Passage. Polar bears were spotted swimming around the boat in Beechey Island where Franklin spent a winter on his ill-fated exploration; a caribou and whale feast with drum dancing was had in Gjoa Haven, a settlement founded by Amundsen. Dew Line stations were also explored; northern lights seen; ice floes navigated and after rounding through the stormy Bering Straits Young Larry arrived at the gold rush town of Nome, where Wyatt Earp ran a saloon. After continuing south to Dutch Harbour, Young Larry finally berthed in Kodiak for the winter, almost 8,000 miles travelled, the 145th boat to transit the passage, and, reputedly, the first by an Irish woman. #Lectures- A lecture: The History of Asgard, from Launch to Gun Running to Conservation by Pat Murphy as previously reported on Afloat.ie is to take place tonight (8pm) in the National Maritime Museum of Ireland (NMMI), Dun Laoghaire. This lecture is a ticketed event –admission is €10.00 (payable at door from 7.30pm) for further details, click HERE. In addition to this lecture, the NMMI are holding another lecture tonight (in the Stella Maris Seafarers Club, Beresford Place, close to Busaras Bus Station). The lecture (starting at 8pm) titled: History of the Irish Naval Service is to be presented by Terry Cummins of the Irish Naval Association. As usual these monthly held lectures are organised by the Maritime Institute of Ireland and held in the city-centre venue of the Stella Maris Seafarers Club. Entry is by voluntary donation to help meet overheads of the M.I.I. which runs the National Maritime Museum in Dun Laoghaire. Public transport: The nearest DART stations are Connolly Station and at Tara Street in addition to the LUAS (Red) line stop at Busáras. Car parking is located in the Irish Life Mall (ILAC) on Lower Abbey Street. #Lecture – "Traditional Boats of Ireland Book Project" is a lecture to be presented by marine archaeologist, Darina Tully next Tuesday 4 February at 20:00 in Poolbeg Yacht and Boat Club, Ringsend, Dublin. All are welcome to the lecture series organised by the Members of Glenua & Friends which is held in the intimate venue located close to the busy heart of Dublin Port. Entry fee of €5 is in aid of the RNLI. The Traditional Boats of Ireland Boat Book Project, completed in 2008, was a unique undertaking that brought together sailors, historians, engineers, historians, folklorists, archaeologists and marine architects to record Ireland's vernacular boating heritage. Ireland has a wide variety of traditional boats, from small fishing boats, inland industrial craft, former sailing work boats and various skin boats along with examples of important heritage craft. This talk will give some background to the Book Project and bring you on a tour of Ireland showing you the wide variety of boats reflecting our rich maritime history and culture. As a maritime archaeologist, Darina has spent over two decades recording small traditional boats and fisheries. She is co-ordinator of Maritime Archaeology Studies at Saor-Ollscoil na hÉireann and has studied at the University of Ulster and St Andrews University. She has been involved in a number of related projects and publications. #LectureILEN - "The Ketch Ilen-Ireland's Sole Surviving Sail Trader" will be the public lecture presented by Gary Mac Mahon next Thursday (7 November) in the Poolbeg Yacht and Boat Club, Ringsend. The talk which forms the members of Les Glénans & friends 2013/2014 lecture series starts at 20.00hrs in the Dublin docklands venue noting an entry fee of €5 in aid of the RNLI. Ilen is a 56-ft sailing ketch that was built in 1926 in the Baltimore Fishery School Boatyard for the Falkland Islands Company. She was designed and sailed to the Falkland Islands by Conor O'Brien who in 1925 was the first Irishman to complete a circumnavigation of the world in the 42-ft ketch, Saoirse, also built in Baltimore. The Ilen served seventy years as a trading vessel in the tempestuous seas of the South Atlantic before being brought back to Ireland in 1998. Now being restored, she is the focal point for a remarkable maritime project embracing the A.K. 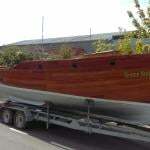 Ilen School for wooden boatbuilding in Limerick and Hegarty's boatyard in Oldcourt. Gary McMahon, in his illustrated presentation, will provide the background to the return of the Ilen to Ireland and the founding of the A.K. Ilen Company with Anthony Keane OSB. Gary is a keen offshore sailor who publishes maritime books through the A.K. Ilen Company and will include Conor O'Brien and his exploits on Saoirse in his lecture.